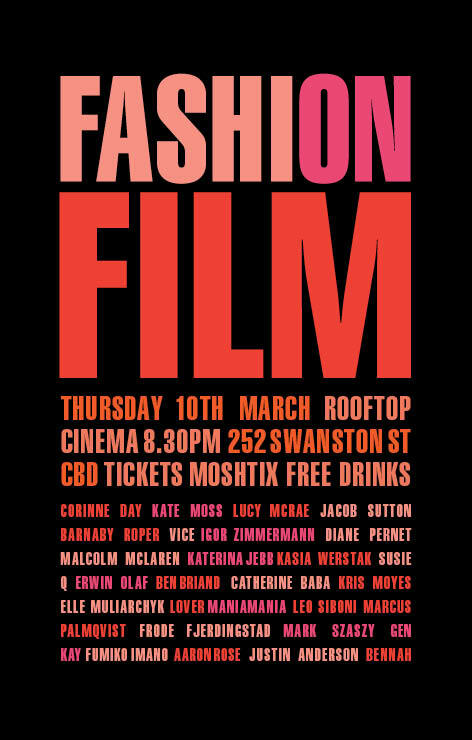 A.C. Journal › Tonight….Fashion Film Festival…..One Night Only…..
Tonight….Fashion Film Festival…..One Night Only…..
As part of the L’Oreal Melbourne Fashion Festival Cultural Program 2011, Art Director Sophie Pike and Film Director Nicole Rose are curating what I imagine would be a dream project….a fashion film festival, one night only….so pack that trench coat, because tonight starting at 8:30pm, will be a visual delight…..to be held at the Rooftop Cinema on Curtain House….20 short films, my personal highlights will include…….a vision of LA though the lens of legendary Alleged Gallery owner now LA resident Aaron Rose, an interview with A Shaded View on Fashion’s Diane Pernet and stylist Catherine Baba; a film for Lover by Kasia Werstak starring Sophie Lowe; Lucy McRae, Kris Moyes, Susie Q & Leo Siboni and Gen Kay. The amazing coup for Sophie and Nicole has been scoring the Australian premier of “Corinne Day Diary”, directed by Mark Szaszy…..shot over a ten year period, it documents the life of this sensitive and uncomplicated photographer…..she captured a whole new vision of beauty in the early nineties and set the tone for what we still consider beautiful……..of course her starring muse was a then unknown Kate Moss, her portraits and fashion shoots captured what lies beneath the glamour in the pages of Vogue….an honesty whose influence is seen in a new generation photographers today………an unmissable night, see you there! This was written by Ana-Cecilia. Posted on Thursday, March 10, 2011, at 6:30 am. Filed under Uncategorized. Bookmark the permalink. Follow comments here with the RSS feed. Trackbacks are closed, but you can post a comment. drop me a line if you get time. ‹ A Night Out with Hope Gangloff…..